In a Sheraton suite in Indianapolis, I swiped Fiona’s cheek ten times with a cotton swab that a technician then dipped in a blue solution and sealed for the labs. Scientists will examine the cells of my daughter’s cheek, look closely at all the chromosomes, map the genes as best they can, and tell us how big her deletion is and what she’s missing. How big, what’s she missing? Right now, I don’t care. The results won’t tell us much yet, not until the field of genetics advances, so the cotton swab is more for the doctors and the scientists who look carefully at chromosomes and learn cool things about them and give the genes names as meaningless to me as the numbers they assign to distant stars. Afterward, my husband and I met with Dr. Amy Calhoun, the assistant to the geneticist who was spear-heading the studies, and she asked if we had any questions. I did. Though my daughter’s future is still a wide-open field of blooming, poppy-colored question marks, her past according to the field of genetics is clearer, and I wondered, as is my penchant, about that past. How did this happen? And I wasn’t settling for the simple answer I got from our wonderful geneticist—that the deletion came from either the sperm or the egg or just shortly after conception. No, I wanted a more thorough story of chromosomal deletions. What Dr. Calhoun told me dramatically changed the way I see Fiona and all genetically inherited disabilities. Then Dr. Calhoun explained that, in order for Justin’s chromosome 1 to pull from a smorgasbord of ancestral chromosome 1’s, reproductive cells undergo a tricky little dance. I’d later learned that this is called meiosis, and that it’s a bit more complex than Dr. Calhoun explained to me. But this is the gist: at some point in the creation of reproductive cells that become sperm and egg, chromosome 1 from a person’s dad finds chromosome 1 from his mom, and chromosome 2 finds chromosome 2, and onward. Each corresponding chromosomal pair now does a little intertwining dance. Dr. Calhoun raised her two index fingers, stuck them together, and wrapped them around one another like snakes. They get tangled. They get stuck together. And then, in biological craziness, they rip apart. “You can already see the issue, right?” she asked with wide eyes. And I nodded vigorously. I knew where she was going: anytime they rip apart, there’s risk that a chromosome will have too little of what it needs, or too much. I was shocked. Every human on the planet was a result of this makeshift process of creating? It seemed like a miracle we were all mostly symmetrical beings. What a bold move on nature’s part. What dice-rolling. What—some would say—ballsiness. Why be so messy? Why not just keep the chromosomes whole? This is where things get really cool, at least to a nerd like me. Because the process maximizes diversity. So that each person is 100% unique. So no two are alike. So some of us are immune to lethal plagues. So some of us are tall, short, fast, slow, good with numbers, allergic to wheat, nonverbal, uber-social, flatulent, fierce, whatever it is. Biology wants a wild mix. I sat there in a suite on the 11th floor of a Sheraton, my mouth hanging open, knowing that Dr. Calhoun didn’t have a clue as to how this bit of information was blowing my mind. I was ah-mazed. 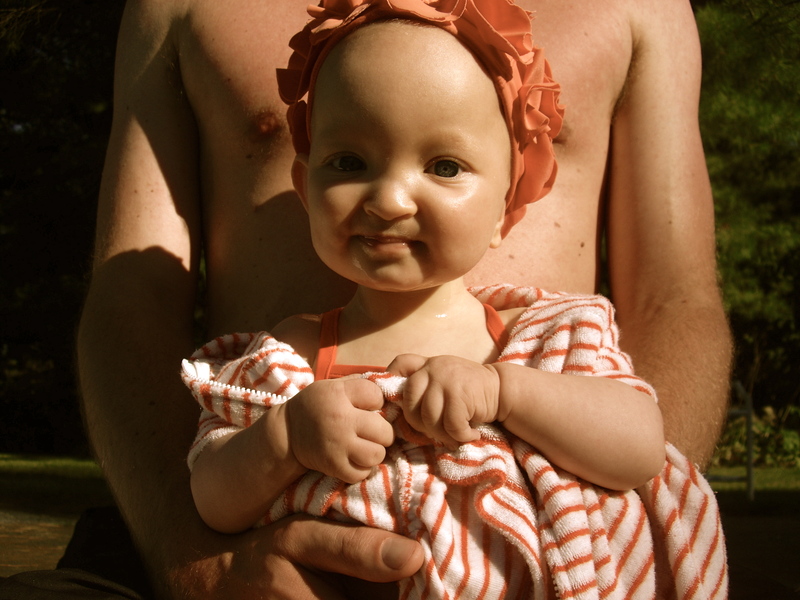 On and off, for Fiona’s entire 13-month long life, I’d been sometimes blaming myself for her syndrome. Why did I encourage us to start trying for a baby a month before we’d originally planned? If we’d just waited another month, maybe Fiona wouldn’t have WHS. Then again, we probably wouldn’t have a Fiona. We’d have another person. And I loved Fiona. So that logic gets screwy. But my brain went there regardless—the “What if I had done things differently” train. The “I have control over the universe and so I am to blame” train. This track isn’t useful and I’d often talked myself off it. Fiona is a gift. Fiona is perfect as she is. Fiona’s “imperfection” is only a subjective perspective of the able-bodied worldview that fails to see the value of her giggle-laden life. True and true and true. But when Dr. Calhoun explained the sticky, rip-apart mechanics of new chromosome creation, the stubborn remnants of self-blame that I’d done my best to weed out dried up completely. I was not to blame for Wolf-Hirschhorn Syndrome. If anyone was responsible, it was biology and its need for “diversity,” and who could blame diversity, with its wild spontaneity and intrigue, with its variation and uniqueness and artfulness. With its Muppet-Show assortment of tall and short and brown and beige and fat and skinny and blond and brunette and gay and straight and introverted and extroverted and on and on and on. It was a golden moment. An eye-opener. I can still see Dr. Calhoun’s two index fingers mock intertwining, and then untangling again. And then she explained that, actually, we all probably have deletions. Miniscule, benign deletions. But there’s so much redundancy in the genes that it usually doesn’t matter. Fiona’s matter. Fiona’s are visible when someone smashes her cells and sorts through the ramen-shaped chromosomes and notices that, oh look, right there, one chromosome 4 is missing its little cotton ball on top. So now, after our meeting in a Sheraton suite with Dr. Amy Calhoun, I think this: Fiona is a work of art brought on by a dubious method of creation. And as a creator myself, I’m pretty used to methods of creation being somewhat haphazard. The overly wrought third draft of a chapter after months of slaving away at the computer. The inspired, streamlined first draft of a poem scrapped together on a napkin in a bathroom stall. It’s not my fault that Fiona is missing the cotton ball top on one of her chromosome 4’s. It’s due to the gorgeous risk of creation. And in some ways I feel like we’re all kind of indebted to it, and therefore to her. The Olympics have been airing, and now when I see the super-able-bodied runners and swimmers and hammer-throwers and polo-players, I see them as a part of a larger equation that Fiona is a part of, too. I see that all of them need each other to complete this equation. It is the same equation that creates Einstein and your great aunt Haddie and the world’s 100 meter gold medalist and me and you. Some would say it’s God. That God works through biology to make the diverse fabric of humanity. That the divine ether that hums and throbs and echoes and envelopes every little molecule guided a portion of Fiona’s chromosome 4 to come off. Or guided the sperm missing that part of its chromosome 4 to find the egg. Or guided a sperm to thrive in its fertilization of an egg which had a somewhat wonky chromosome 4. So some would say Fiona’s WHS was divine inspiration. That’s another way, I suppose, of putting it, but I’m in no condition to say what God is or isn’t, what God does or doesn’t, especially after watching Justin read Meister Eckhart to Fiona this morning, in particular a passage where Eckhart essentially argues that one can’t define God. God isn’t this, and God isn’t that, so one best shut up about God, says Eckhart. Justin read this to Fiona and then looked up between sentences, and she giggled and gave him a smile.